Breathe in, breathe out. Simple enough, right? Hardly, as anyone with a cold, allergies or asthma knows. Now think about our horses. Weathering winter in stuffy barns, working in dusty indoor arenas … a horse’s respiratory system, particularly during the colder months, can be easily stressed. Here’s what to watch for when it comes to your horse’s breathing and how to stay on top of his respiratory health. One of the most common respiratory ailments diagnosed in horses is recurrent airway obstruction, often abbreviated RAO, or referred to by its common name: heaves. A much older, colloquial term you may have heard for this condition is “broken wind.” In decades past, when the physiology of this equine disease wasn’t fully understood, it was known as equine COPD, or chronic obstructive pulmonary disorder. However, as researchers learned more about the cause, they discovered the equine condition was very different from the human respiratory disease with the same name. In order to avoid confusion (and more accurately describe the equine disease), the name was changed to RAO. In the broadest sense, RAO is an allergic reaction to inhaled allergens, most commonly airborne microscopic molds and pollens. Some veterinarians refer to this condition as “equine asthma.” With no age, gender, or breed predilection, RAO can occur seemingly at random—it all depends on your horse’s individual response to allergens in the air. 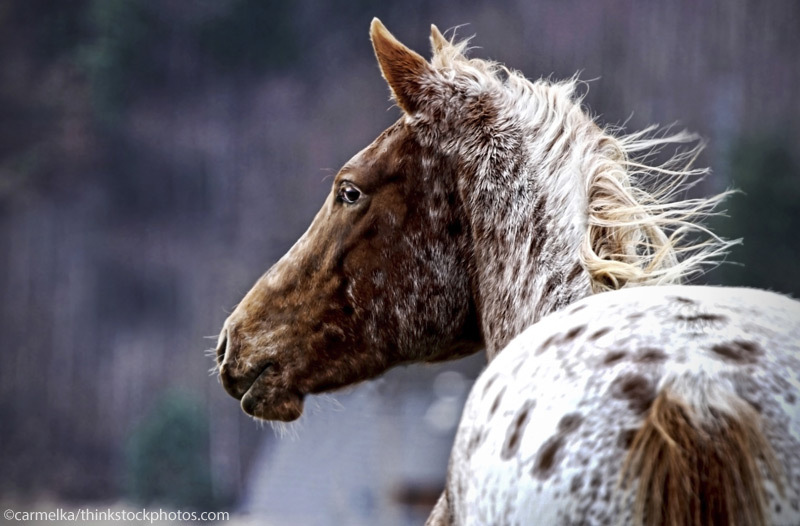 In an affected horse, his immune system will occasionally overreact to an inhaled allergen. This overreaction occurs deep in the airways where special immune cells panic, releasing chemicals that cause a range of clinical signs, starting with airway constriction. As airways become smaller, the horse has to breathe harder to get the same amount of air. This results in the classic “heavey” horse: flared nostrils, elbows sometimes out, and abdomen heavily moving with every breath. Most veterinarians will be able to diagnose heaves based on a horse’s history and clinical signs alone. If there is any ambiguity, however, fluid samples from your horse’s airways can be collected, cultured for bacterial growth, and examined under a microscope. Depending on the types of cells collected, a diagnosis can be made. Horses with heaves will typically have an increased respiratory rate and effort while at rest—this is a direct result of the airway constriction occurring within the airways. They also have a dry, hacking, chronic cough and may have nasal discharge. RAO horses do not have a fever and they are not contagious, although they are at risk of developing other respiratory illnesses such as pneumonia, which will result in fever, lethargy and reduced appetite, and will require antibiotics. Once a horse develops RAO, it can’t be treated, only managed—again, similar to asthma in humans. However, with today’s advances in veterinary medicine, horses with RAO are living better than ever, and many can still continue their athletic careers. The primary goal of RAO management is to prevent aggravation of the horse’s allergies. This is most effectively done by managing the horse’s immediate environment. Ultimately, fresh air really is the best prescription. Horses with RAO are best managed when they are kept on pasture full time, even in winter. Being stalled keeps a horse in close contact with dust, mold, and pollen—all of which can trigger a flare of heaves. Instead, keeping an RAO horse outside helps dilute any contaminants he is inhaling. While some horse owners might be hesitant about keeping an RAO horse outside during the cold winter months, rest assured that the fresh air is more beneficial to the horse’s lungs than a snug stall; however, blanketing and run-in shelter recommendations still apply. If an RAO horse must be kept in a barn, there are some specific things you can do to help make the immediate environment as low-dust as possible. The first step is to not sweep or distribute hay while the horse is in the barn; these activities merely stir up dust and other particles. Secondly, do not use straw as bedding. Shavings are preferable, as are other low-dust options including chopped paper or cardboard. Feeding is another aspect to consider for RAO management. Many heaves horses will exhibit clinical signs in winter when it is typical to feed large quantities of dry, dusty hay. Soaking hay in water using a hay net before feeding is helpful in reducing the amount of dust and spores the horse is exposed to, and will help with mild cases of RAO. However, severe cases may require avoidance of hay altogether. These horses should be slowly transitioned to a pelleted complete feed diet. Avoiding round bales when horses are on pasture also helps, as these types of bales can have high levels of certain types of dust that are particularly irritating to RAO horses. Although environmental changes are the best way to manage RAO in the long term, short-term medical solutions are frequently needed when a horse has a flare-up. If your horse experiences periods of labored breathing due to RAO, your veterinarian will typically prescribe a round of corticosteroids. This medication effectively decreases the amount of inflammation inside your horse’s airways, making it far easier to breathe. In severe cases of heaves, oral steroids are not strong enough to combat clinical signs. In these cases, the horse requires a more direct method of getting a strong steroid directly into the lungs. Luckily, there are equine inhalers on the market made specifically for this need. All steroids, whether inhaled or given orally, should be prescribed by your veterinarian. These medications can have side effects and will have specific dosing instructions that need to be followed exactly. Never give your horse a steroid without your veterinarian’s guidance. Even if your horse doesn’t have heaves, being mindful of the air quality where he lives is still important, especially in the winter. Barn air can quickly become stuffy when all doors and windows are closed. Even if dust doesn’t seem to bother your horse, ammonia from urine is extremely irritating to the sensitive lining of his respiratory tract. Ammonia fumes are mild irritants at best, and at worst can put your horse at risk for respiratory infections. Even in the coldest of temperatures, air quality will improve if there are some windows open in a barn, even overnight. Air circulation is the key. 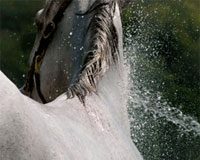 If air isn’t moving, it’s stagnant and loaded with particles that have the potential to irritate your horse’s airways. Respiratory wellness is important in all horses, not just those with heaves. Understanding how your horse’s immediate environment interacts with his airways is vital when choosing what’s best for your horse.